Preheat oven to 425°. Line a baking sheet with parchment paper and set aside. In a medium bowl, whisk together flour, baking powder, salt, and sugar. Cut in 5 Tbsp. butter, cubed, and shortening into flour mixture using a pastry blender or two knives until butter is the size of peas. Slowly add buttermilk to flour/butter mixture, using a wooden spoon to mix. Add 1 Tbsp. honey and stir to combine; mixture will be wet. Turn dough onto a floured surface. Lightly dust top of dough with flour, then shape into a rectangle. Laminate dough by folding dough into thirds, as with a letter; repeat shaping and folding two more times. After the final fold, shape dough into a 10”x6” rectangle. Cut dough into 8 biscuits using a knife (for square biscuits) or a round cutter. Place cut biscuits on prepared baking sheet and chill for 15-20 minutes. While biscuits chill, make honey butter glaze by melting together remaining butter and honey gently over low heat. Mix until combined and set aside. Brush biscuits with honey butter glaze and bake 12-15 minutes until golden brown. (Save extra glaze for sandwich assembly.) Remove biscuits from oven and immediately sprinkle with sea salt. Place on a cooling rack until ready to use. Place chicken in a bowl with buttermilk, cover with plastic wrap, and chill 1-2 hours. Prepare frying stations. In a shallow pan, mix together flour, panko, chili powder, salt, and pepper. In another shallow pan, whisk eggs. Heat 2” oil in a cast iron skillet until oil reaches 350°. Place a cooling rack on a paper towel-lined baking sheet and set aside. Prep and cook two pieces of chicken at a time. Drain excess buttermilk from chicken, then dip into egg, then cover in flour/panko mixture. Place in oil immediately. Fry each piece until golden brown, rotating once, approximately 3-4 minutes per side. Once the pieces are done, place each on prepared cooling rack. Reheat remaining honey butter glaze. 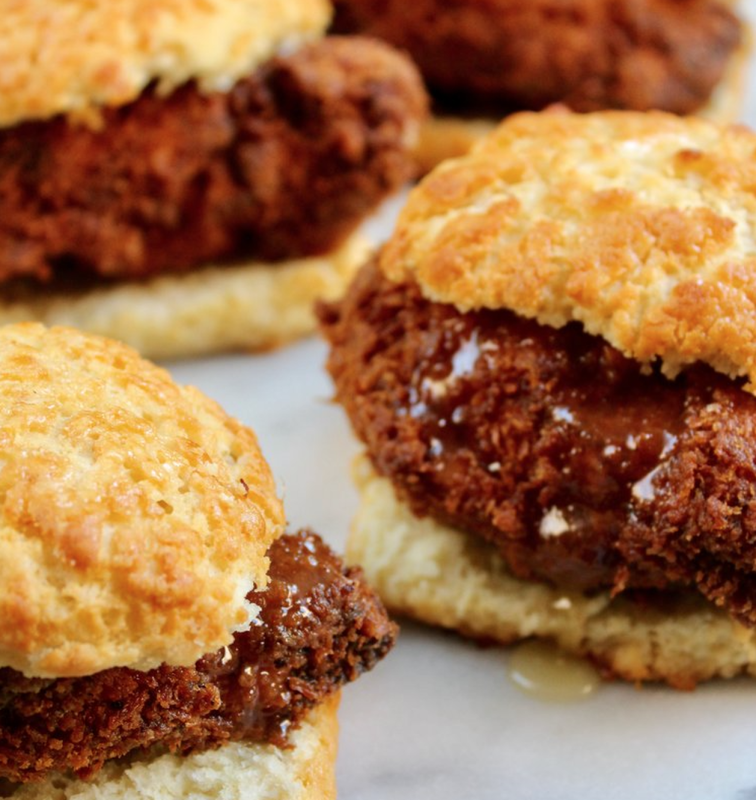 To assemble, cut a biscuit in half, add a chicken piece, drizzle with butter honey glaze, and replace biscuit top. Serve immediately.